Cooking Channel Ice Cream Truck Sept. 25—Free Scoops! The newly-launched Cooking Channel has created a one-of-a-kind ice cream truck to satisfy fans’ cravings for this year’s most delicious ice cream flavors. 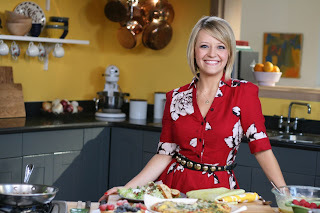 Join Food Network star and host of “Kelsey’s Essentials” on the Cooking Channel Kelsey Nixon from 11 a.m. – 6 p.m. this Saturday, Sept. 25, the Cooking Channel Ice Cream Truck visits Chicago French Market (131 N. Clinton St., Chicago; 312-575-0306), the hub for the West Loop/Fulton River District Community. Cooking Channel ambassadors will give away Cooking Channel apparel and scoops of Capannari Ice Cream, including Mint Mousse, 10 Year Aged Madagascar Vanilla, Black Licorice and more. Check out http://www.cookingchanneltv.com/, Cooking Channel ‘s Facebook page and Twitter.com/CookingChannel to see the most up to date tour schedule, tune in information for the hottest shows, and information on the coolest chefs. 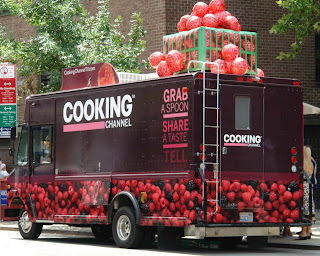 Cooking Channel (http://www.cookingchanneltv.com/) is an entertainment brand dedicated to today’s passionate food lover. For food people, by food people, Cooking Channel is the answer to a growing hunger for more content devoted to food and cooking in every dimension from global cuisines to international travel, history and unconventional how-to’s. Scripps Networks Interactive (NYSE: SNI), which also owns and operates Food Network (http://www.foodnetwork.com/), HGTV (http://www.hgtv.com/), DIY Network (http://www.diynetwork.com/) and Great American Country (http://www.gactv.com/), is the manager and general partner. Visit Pastoral from 5 p.m. to 6:30 p.m. Sept. 27 for a sampling of different products. Taste Italian honey and a variety of cheeses at no cost. Take a look at the breads and wines that Pastoral also offers. Come to Pastoral from 4:30 p.m. to 6:30 p.m. Friday, Oct. 1 to taste wines and cheeses. Receive an assorted Italian cheese plate as well as small portions of four Italian wines: Bele Casel Prosecco, Inama Soave, La Corte Solyss Negroamaro and Vietti Perbacco Nebbiolo. Reserve tickets in advance. Sampling costs $15. The tasting begins promptly at 4:30 p.m. and lasts until the final drop of wine is poured. The event takes place in the public seating area of Chicago French Market. Event registration includes a 15 percent in-store discount the evening of the event. Owned by partners Greg O’Neill and Ken Miller, Pastoral was named as 1 of 6 Outstanding Specialty Food Retailers by the National Association for the Specialty Food Trade (NASFT) in 2007. The company prides itself on offering the highest quality of European-inspired fine and artisan cheeses from around the world, small production wines and freshly baked breads. Join Chicago French Market as it welcomes the Good Food Project from 11 a.m. to 1 p.m. Saturday, Oct. 2. With help from Susan Taylor, a Chicago Tribune food critic, children will learn how to taste like a pro. Each child will be among the first in Chicago to taste the new SweeTango apple along with three other varieties of apples. 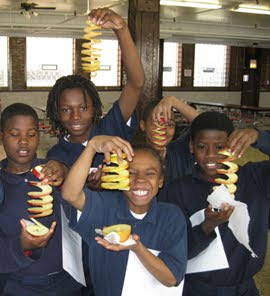 Upon selecting their favorite apple, the children make an apple slinky to bring home to show friends and family. $5 donation to the Good Food Project per child ages 5-10 (includes one guardian) and tickets can be purchased at the door. The Good Food Project’s mission is to introduce different flavors of produce to children in order to develop a lifelong love of good food and healthy living. Visit http://www.thegoodfoodproject.org/ for more information. Quench thirst at Frietkoten’s Oktoberfest Beer Tasting at Chicago French Market from 4:30 p.m. to 7 p.m. Thursday, Oct. 7. Taste samples of six seasonal beers, from Pilsner to Bock, and munch on a cone of Belgium fries for $15. Tickets can be purchased the day of the event. Satisfy your sweet tooth with Swiss-trained master chocolatier and owner of Canady Le Chocolatier located in Chicago French Market, Michael Canady, from 5 p.m. to 6:30 p.m. Friday, Oct. 15. Come listen to a presentation from Canady about his background and the art of making chocolate. Attendees will receive a gift of hand-crafted chocolate. The event costs $15. RSVP by calling (312) 212-1270. Walk-ins are accepted the evening of the event. Studying chocolate in Switzerland and beginning Canady Le Chocolatier out of his former home in Dhahran, Saudi Arabia, Canady is well-known across the globe for his treats. Canady Le Chocolatier offers a wide variety of homemade, artisan chocolates including: bon bons, truffles, nougat, ganache and dipped fruit slices. Saigon Sisters, owned by sisters, Mary Nguyen Aregoni and Theresa Nguyen, hosts a Bánh Mi Vietnamese sandwich sampling and beer event from 4:30 p.m. to 6:30 p.m. Thursday, Oct. 21. Choose samples of four different Bánh Mi Vietnamese sandwiches at Saigon Sisters, wash them down with one domestic draft or non-alcoholic beverage of choice, and enjoy live music. Tickets are $15 and can be purchased the day of the event at Saigon Sisters. The concept for Saigon Sisters was inspired by the family business, run by the sisters’ grandmother and mother, in a Vietnamese market similar to Chicago French Market, which sold produce, rice, seafood, and prepared food. The two sisters moved to a more modern environment in Chicago but still maintain the same principles of offering fresh and healthy Vietnamese food. Celebrate Halloween by bringing the kids out to Chicago French Market Saturday, 11 a.m. until 3 p.m. Saturday, Oct. 30 for Trick-or-Treating. Each individual vendor is distributing candy and other treats to the children throughout the day. Enjoy a fun-filled, all day event at Chicago French Market with spooky decorations for Halloween. Also take a peek at the wide array of foods that Chicago French Market has to offer. For a full list of upcoming events at Chicago French Market, press here.